Sea kayaking with seakayakphoto.com: Karitek Easy Load Roof Rack long term review..
Karitek Easy Load Roof Rack long term review..
After I tore tendons in my shoulder lifting a Delphin off my roof rack I fitted a Karitek Easy load roof rack. I have already reviewed this here but thought it would be worth revisiting given I have now started kayaking again after shoulder surgery. It has now covered about 4,000 miles driving round Scotland and my friend Mike who also bought one at the same time has probably done the same. The rack has survived motorways at 70mph and bouncy country roads at slower speeds. We were particularly impressed how it handled 3 kayaks on the very rough single track road that leads out to Ardnamurchan point. At first sight it is an expensive bit of kit. However, it is a drop in the ocean compared to the expense of the shoulder surgery and being off the water for seven months. 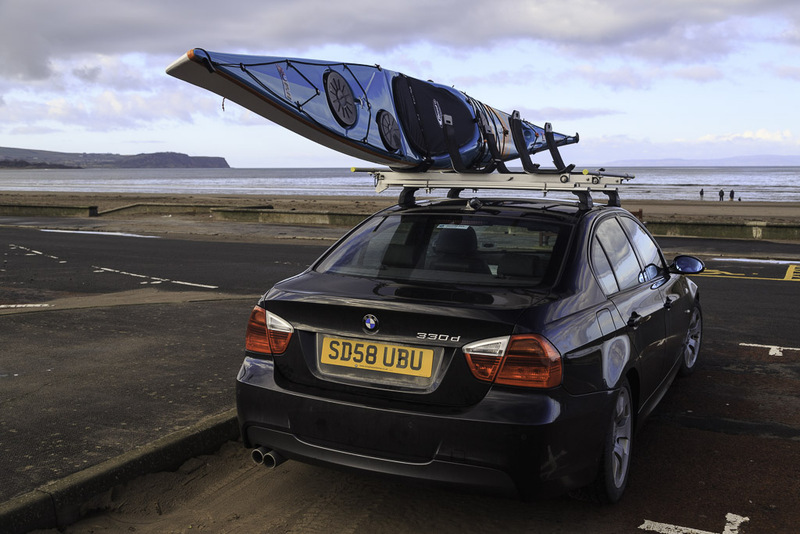 Think very carefully before loading a kayak onto your roof rack on your own. I didn't. I had been doing single handed lifts for 11 years and ignored the warning signs until the fateful day. With my arms above my head I had just started lowering the kakay to the ground when I heard a snap then heard and felt a longer ripping sensation deep in my shoulder joint. The noise and the pain almost caused me to vomit. Afterwards a contrast MRI scan of the shoulder showed I had torn tendons, ligaments and the joint capsule itself. 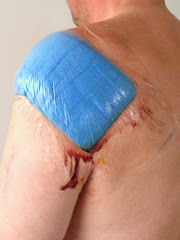 Contrast media (which was injected into the joint capsule) leaked out and made its way down to my elbow. Back to the Karitek ELRR. One of the great advantages for loading solo is that it can be done at waist height. It really is a piece of cake. The rack is a pleasure to use. So how has it stood up to use? Well it is almost all made of aluminium and stainless steel and has resisted the rigours of weather and salt water with no visible corrosion. Nothing has worn out. Two small problems have occurred, both caused by me leaving the rack on my monoblock drive during a torrential rainstorm. I was removing the rack from the car when the storm struck and so left it horizontally on my drive while I rushed indoors. The rain caused the sand (which grouts the monoblock) to bounce up into the channels in which the rack's brass pivot wheels run. It sounded dreadful when I next attempted to slide it up and down. Unfortunately a hose and water was not sufficient to shift the sand (which had stuck to the light spray lubricant inside the channel). I cured this by soaking a rag in degreaser and pushing it through the channel with a screw driver. Smooth sliding was restored. The sand also made the plastic roller that runs over the top of the roof bars stiff. I unscrewed this to clean it but unfortunately I also unscrewed the helicoil insert (which its retaining bolt screws into). Karitek sensibly use helicoils to retain all the stainless steel bolts that screw into the softer main aluminum members of the rack. If one does come out, they sell a helicoil replacement kit with installation tool for £3. This includes 4 helicoils. The repair took about 5 minutes (as I had disassembled part of the rack) but the Karitek tool would allow the repair to be made in situ. I will not be leaving the rack horizontally on sandy ground again. 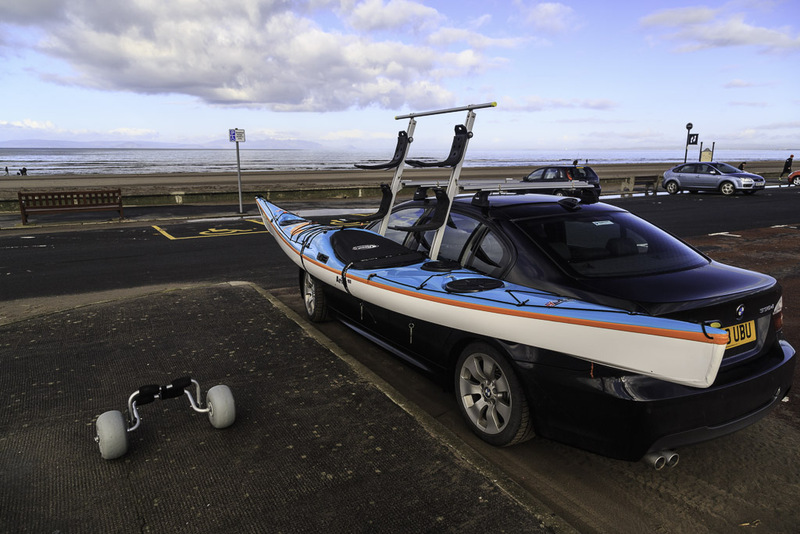 In conclusion, and after extended use, I have found the Karitek ELRR to be an eminently practical and reliable solution to handling a sea kayak on my own. Without it I would not yet have been able to return to sea kayaking. This is truly a 5 star piece of kit. Hi Douglas I am very like you I have been recovering from operation to rebuild rotator cuff tear after lifting my kayak onto rack. My surgeon said I am too old (53y) to be lifting such things. I hope to be paddling again by 4-5 more months. I will for sure order a Karitek rack because there will be no more lifting for me. Henk I wish you a speedy recovery, follow the physiotherapist's instructions to the letter! What bars are on your car and what J-mounts did you go with? Does the ELRR fit right over your existing bars? Thanks! Thanks Douglas. Right now I'm looking at the Thule Hull-a-Port PRO due to their folding down. I have Yakima racks but was told that their less expensive J-Cradles would not work with the ELRR bars. I often park in my garage and am limited by the height. Awesome. Ordered today, my shoulders thank you.